The most common reason I run into is improper coverage. This simply means that there is not enough thinset beneath your tile to properly adhere it to your substrate and support it. If there are any unsupported areas beneath your tile along the edge or in the corner of the tile, walking on it will eventually work what little support it may have loose and the tile will move down and up every time you step on it. The tile moves, the grout does not. The grout loses the battle and starts to crack out. By ‘crack out’ I don’t mean like that ridiculous Intervention show on cable, I mean it will start to crack and come loose. To fix this you need to remove and properly reinstall the tile. If it is only one tile it may be an isolated incident in your installation and you will be fine. If you have cracked grout all over your tile installation it was either improperly installed or . . . If you have a wooden subfloor and your tile is directly installed to it – go pick out new tile. That is more than likely an improper installation. While tile can be installed directly to plywood it requires a VERY specific method. And I do mean very specific. More than likely it is simply installed improperly probably by someone that did not know any better. If it was properly installed over plywood, well, your grout wouldn’t be cracking. Start reading this paragraph all over. Or . . . If you have Hardiebacker, Durock, or any other type of cementious backerboard beneath your tile it should have been installed in the proper manner. It needs to have thinset beneath it, it needs to be screwed down (properly), it needs proper spacing, etc., etc. Read How to Install Backerboards for Floor Tile to see all the things that should have been done. More than likely there is no thinset beneath your backerboard. Thinset is not used to adhere the backerboards in any way – it is used simply to fill voids beneath the backerboard. It is placed there specifically to prevent your tile from moving. Moving tile leads to cracking grout. But you knew that – or you should start reading this page all over. This would be another time to start shopping for new tile. You do not have expansion space around the perimeter of your tiled room. No, the tile will not expand – but your walls do. If there is no space between your tile and walls it will force all the pressure into your tile. This will cause cracking grout and, eventually, ‘tenting’ of your tile. You do not have expansion joints in your tile. For every application there are specific spans of tile which can be installed before a ‘soft joint’ is required. This is simply a grout joint filled with a matching caulk or silicone to allow for movement without cracking your grout or tenting your tile. Most of these measurements are over 25 feet. So in English: if your room is not 25 feet long or wide this is not the reason your grout is cracking. If your tile is on concrete – directly on concrete – your slab may not have proper expansion joints or the tile installation did not honor those. If installing tile directly to concrete (and you should not) there needs to be a soft joint directly above, or two inches on either side, of the slabs expansion joints. If not your slab will move differently than your tile. And there could be a host of other, less apparent or less common problems. However, if your grout is cracking it is probably for one of the reasons above. The method of repairing it depends entirely on why it is cracking. Most of it, as with most tile installation problems, is due to improper installation. If you have any questions about the proper way to repair your tile or grout just leave a comment. I answer every one of them – really, look around the site. I’m just super cool like that. I’ve recently purchase a newly built home. I am now noticing cracks in the grout in numerous areas from the shower, to the grout line on the countertop, and the grout on the floors. I’m starting to think the individual who did the tile work used to much additive in the grout mixture. The are small pin holes in numerous area. Any suggestions on this issue? After reading multiple posts, I fear I am in the same situation. Last year, I hired a contractor to remodel my kitchen. I removed my hard wood floor and installed tile. As soon as it was laid, I noticed big divots out of the grout in multiple areas. Other areas had what I would call small holes within. I brought it to his attention, he said it would be corrected. I researched the issue and told him that application of grout on top of previously laid grout would not work which is what he said was needed. But as soon as my back was turned, he did just that. You know what I am going to say next…yes, it began to disappear into my vacuum and on my mop. I would complain and he would say it was residual and that the floor hadnt been cleaned properly. The last straw was bending over to clean a spot on the grout with a dampened paper towel and having it pull up like.mud. Shortly after, I had a steam cleaner test a spot and yep it lifted grout out. Now, a year later, he said he is going to remove grout and replace grout between tiles. I have no flooring experience but know that it was laid upon sheets of material.that looked like egg crate but so not recall seeing a thinset. Given that I have paid a significant amount of money for this remodel, is this the most appropriate solution? I dont plan on moving any time soon. Should the floor be removed and replaced? Thank you for your response in advance and for the plethora of information.. Quite helpful. I believe it is too much movement. Not necessarily the people walking over it (although that contributes), but concrete, especially in an exterior application, moves A LOT. I know you said you can’t, but the only solid repair is to remove and replace it using some sort of cleavage membrane or substrate (even painting redgard over the concrete would likely help give it enough flexibility to withstand that movement), or using a high quality flexible mortar. Very nice work, by the way! I have been installing tile for 6 years and never had in issue… till now. The Floor was plywood… weinstalled schluter ditra underlay with thinset. Let it dry 24hrs. Then tiled floor. Let it set for 24 hours then grouted. 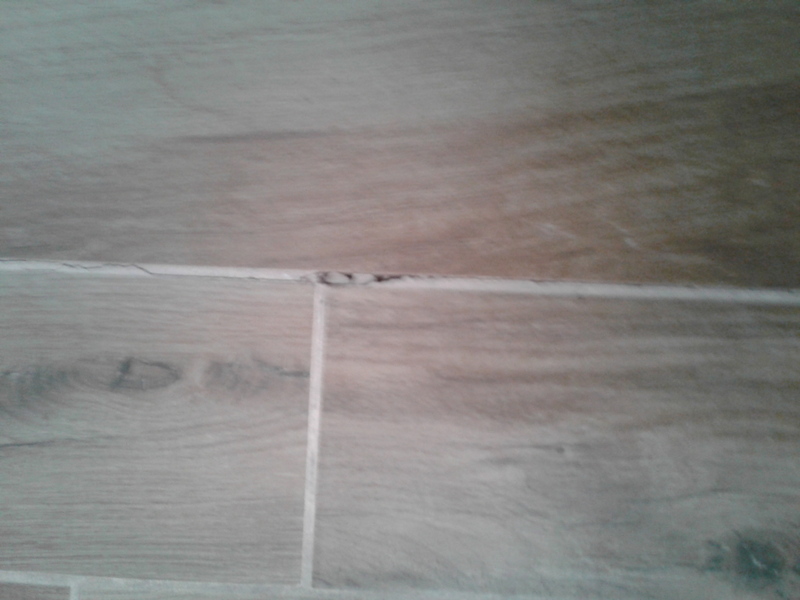 Now only after 1 month, the customer sent me a picture of the floor and the grout is completely crumbled and she said the tiles were chipping also??? dont understand! Wow, that’s, uh, general. It is impossible for me to give you a specific reason, it could be many, many things, either one or a combination of a few. My first guess would be the deflection of the floor – how are the joists spaced? What is the unsupported span? Do you know the specific build makeup of the floor you installed over? Was it hot that day (premature thinset skinning)? Did you backbutter? Is the floor being used as a trampoline? Are they driving forklifts over it? Is the cracking only over plywood seams? Or joists? How many layers of plywood? How thick? What thinset did you use? What product is being used to clean the grout? 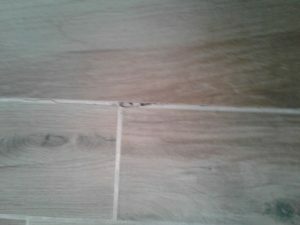 Are the tiles chipping or cracking? Just going over ‘plywood’ is all the info you’ve given me, I need many specifics to even take an educated guess. Even then it’s just that – a guess, without being able to examine it in person, or at least detailed photos. Did you do anything different with this install? Can you please share with us what that very specific method is? Three years ago the tile was installed in the kitchen. Tile and grout in one half of the kitchen is fine but through the second half the installer was really rushing to finish. Six months later the first break in the grout appeared followed by the first hole after I vacuumed the floor. During the past three years this ‘rushed’ grout developed more and more brakes and by now there is almost no grout in-between the tiles. What do you think went wrong? It could simply have been mixed incorrectly (waaaaay too much water, but it makes it a lot easier to grout), or the structural integrity under that portion may be less. Was he rushing to finish setting that part as well? Or he could have started tiling on the part that is fine, and finished on the part that is not without mixing new thinset, the thinset became progressively less ‘effective’ at holding (beyond it’s pot life). There could be a number of reasons, I would need way more detail to help you nail down the cause. Hi Roger, we moved into a new build home 4 months ago. We have cracked and crumbling grout between the baseboard and the ceramic tile in a couple of places in our home. Not more than a few feet in length. Can I just remove and replace the crumbling grout? The tiles don’t seem to be moving and are not cracked or raised. The tiles seem fine. You need to replace the grout along the baseboard with silicone. That is a change of plane, which means the two planes will move in different directions. Silicone can compensate for that movement, grout just cracks. Ok, I’ll bite: What is the proper way to repair cracked floor grout? Tile is on concrete slab. If the tile is bonded directly to the concrete then you’ll need to remove and replace the grout. In that case the cracked grout is due to concrete movement. It may or may not last, depending on how much the concrete will move in the future. If there is a membrane such as ditra beneath the tile then there is likely an issue with the bond of the membrane to the concrete, in which case the underlying issue will need to be fixed or any fix of the existing grout will not last at all. The response of my contractor to cracking grout in a new construction home I purchased 45 days ago, is it reasonable? I need a LOT more info to answer your question. I will say that a properly installed tile project will not have problems with cracking grout, because movement is compensated for in the installation. If the slab is cracking that quickly then the biggest issue is with the slab being either improperly mixed and installed or not having adequate joints, which, again, are compensated for with a properly installed tile installation. Is the tile bonded directly to the concrete? Roger, thank you for the response. I know little to nothing about these floors. Tile is bonded to the concrete and the crack is one seam the entire length of the floor. Let me know what else you need to know. In that case there absolutely should have been a membrane of some sort installed beneath your tile. There are many to choose from. They are most commonly referred to as crack-suppression membranes. The reason we install those between concrete and tile is specifically for this reason. There are two types of concrete – cracked and not cracked YET. The installation company should have known this. There are also mortars made specifically with some built-in flexibility to allow a bit of compensation with substrate movement, but it sounds to me like there was no compensation at all built into your tile. Do NOT let him go in and install over those cracks when it’s ‘done cracking’. It may be finished cracking, but it is never finished moving. That’s why it cracked where it did. There should have been a saw-cut isolation joint cut into the concrete at the very least. And a membrane put over that. I don’t know if you have any intentional joints in your slab, but something was done incorrectly there. And the fact that tile was installed directly to it without movement compensation is on the tile company. So between your tile company and concrete company (or, more likely, your builder who subcontracted those) they need to deal with the issue. And the only PROPER way to do that is to remove what is there and install it properly. The concrete can’t be redone, but joints can be sawn into it where need be. And some type of membrane needs to be under the tile. I sincerely appreciate your expertise and insights. My contractor renovated two bathrooms on my upstairs level about 1 year ago. The tiles are cracking, grout is coming up and one tile “pops” when you walk on it. He came today and said “his guys” would pull up the tiles and re grout the area and put the tiles back down. They were placed on plywood and he is not going to pull up the floor and redo it. I fear this is an ongoing problem and I have wasted 70K with this guy, I can’t afford to hire someone else as I given this guy all the money I had. I am disappointed with this industry and feel like there are no good people. I feel like these contractors hire unskilled laborers and charge insane amounts of money and pay them nothing- more profit for the contractor. Now the work is failing and I am screwed. Help! Not sure where you’re located but if you speak to the building code department in your local area they can give you your options. There are a LOT of good professionals in this trade, unfortunately, like EVERY trade, the few bad ones screw it up for everyone. Everyone is driven by profit, but when that becomes your only motivation you should not be in this trade. Thorough research is the way to avoid these people. Make sure the guy in charge is going to be around, if not the guy doing the installation.